For the last two years, seminars, master classes and workshops have been taking place at the digital manufacturing laboratory at the Escuela Técnica Superior de Arquitectura in Seville. IND_Center promotes collaboration between students, teachers, researchers and institutions, enterprises and other universities. It aims to build an ecosystem for research, implementation and enterprise development. 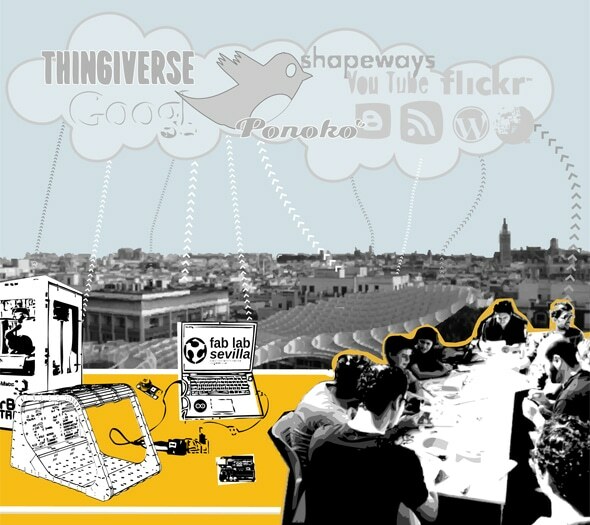 Fab lab Sevilla find its place among the fields of architecture, social innovation, commons and free culture. It is a very interesting place for architects and designers to learn through open source software practices. These “hands on” practices in the commons and the open design framework are being developed mainly at different workshops all year round. Attendants experiment collaboratively with algorithmic procedures and speculate on the possibilities of robotic construction. 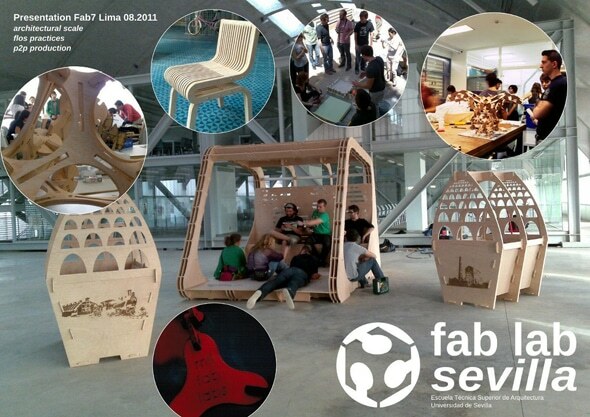 We can find a collection of the academic work produced between 2010 and 2011 at Fab Lab Sevilla on the FabWorks book. Among all projects developed at Fab Lab Sevilla, I would like to present Fabbing CC. Fabbing CC is a research-action project that explores the translation of design and digital fabrication technologies to an urban environment. As part of the “Rivera Marco” urban regeneration project in the city of Cáceres, it was aimed for citizens to participate in the process. Between March and May 2011, Fabbing CC created an open system in which to develop three interventions in the public space. These interventions consisted on collaboratively designing and building open prototypes with citizens. The result is thoroughly documented here and plans and designs can be found at thingiverse. Fabbing CC was developed at three workshop-seminars where attendants discovered digital manufacturing technologies and their possibilities. Below, you can read an interview with the architect José Pérez de Lama about the Fabbing cc project. 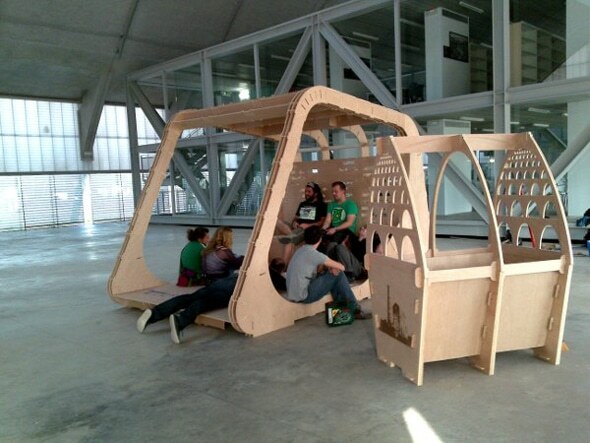 José Pérez de Lama [Seville] is a member of hackitectura.net, Ph.D. in Architecture and a professor at Universidad de Sevilla Escuela Técnica Superior de Arquitectura, and co-director of the Digital Fabrication Lab / IND_Center in that institution. What did citizens involved in the open design process know about digital manufacturing technologies before the workshop? How was their reaction upon discovering them? JPL: The producers in the Cáceres side – around geographer and social-cultural organizer Adolfo Chautón – knew about digital fabrication from a conceptual perspective. We had been discussing it for some time. They come from an open source experience; they had been working on an Open Source City / Territory concept for some time. 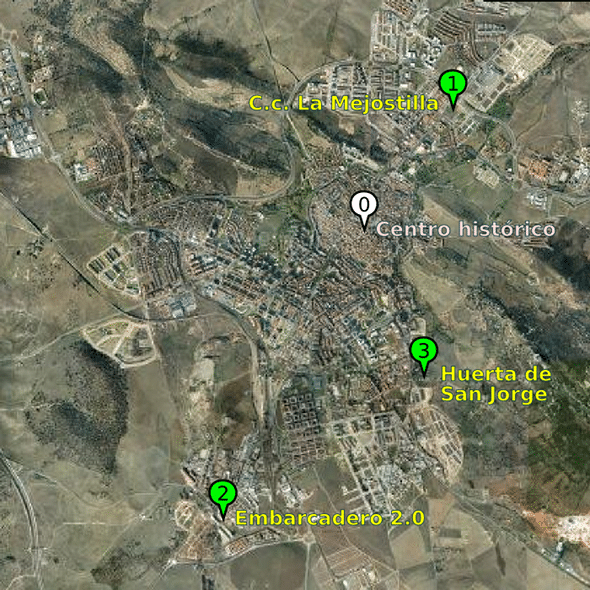 In Extremadura, the region Cáceres is part of the FLOS [Free Libre Open Source] where that paradigm is a strong one. Their government, was probably the first regional administration in the world taking action towards development model around Free Software – including development and intense social implementation of Linex one of the earliest local distributions of Linux [i wrote about this in 2006 in my book “Devenires cíborg”]. Therefore, the idea on both sides was to insert the FLOS digital fabrication concept into their 10 year long local experience on regional development around Free Software. Current local organizations and people participating in the Fabbing CC process didn’t know so much about digital fabrication, but i wouldn’t think they would be too surprised. Some of them were already working on digital design; most of them knew and were users of Free Software. However, i think many were quite excited and inspired. The idea was also that Fabbing CC would be a seed to develop a Fab Lab in Cáceres. And i think it still is! For Fabbing CC we designed a process with two main production teams, one with local Cáceres -Extremadura people who were all the time on site, dealing with facilitating the participation and relations with local administration, and the other with the Fab Lab team which was in Sevilla, dealing with the design and fabrication process, making several trips to Cáceres throughout the process. In the first seminar- workshop we made two main presentations in order to introduce the topic. One of them dealt with a theoretical-conceptual approach, to the actuality and virtuality of digital design and fabrication, from an open source and sustainable perspective, – making emphasis on the Fab Lab Network model, which is a particular form of approach to the field, – connected in many ways to the “social hacking ethics and practices”. The other one was more specific on design tools and machines available at Fab Lab Sevilla, not so much teaching these issues, which would be difficult in this time set up -, but rather showing what kind of things could be specifically done. On one hand we showed how parametric design works, on the other the specific construction techniques feasible with machines like laser cutters and CNC milling stations. We tried as well to show case studies that we thought could be inspiring to participants. Then we discussed the sites that we were supposed to work in [two of them, at this phase]. Participants explained their perceptions, needs, expectations, desires. Some of them had already concrete ideas, proposals and even designs. We made some collective mapping of these ideas, and tried to approach some lines of work, to define, given the budget, what kind of interventions-designs we would be able to engage during the brief time period that we were going to be work together – trying to think of them as acupuncture actions, or seeds for future development. These information and documents were posted in a blog created for the project – http://htca.us.es/blogs/fabbingcc – that the different participants were invited to use as a communication and collaborative production space. The Fab Lab Sevilla team made intensive use of the blog showing the various ideas and designs coming up after the first workshop – and throughout the whole process. Some of the local teams, with design experience, posted as well designs of their own. During the next two weeks the network elaborated on these materials. On the Fab Lab Side we made a scale model for each site, and trying to interpret those ideas, fabricated a model kit of architectural proposals to allow people to play around with them and study various alternatives. Which were the strategies that allowed you to introduce all citizens’ ideas/suggestion/demands? How did this digital manufacturing technologies change the participatory manufacturing? JPL:The second workshop-seminar was actually organized around the scale models. The workshops took place on site, in both locations. Participants working collectively made successive configurations using the models and kit parts, and variations on them. We took as well materials to cut and make manually new elements on the fly. Various resulting configurations were discussed and evaluated. As a conclusion to the second workshop, on site, and later on using the blog and the mailing list, decisions were taken as what the full scale elements to design-develop and fabrication should be. These decisions were taken among the local organizing team, the Fab Lab team and some of the participants that became most involved in the project – with a rather tight-timing concern. This group of more involved local participants made a visit to the Fab Lab to learn more about the fabrication details – Sevilla and Cáceres are about 250 km away. They participated in the actual fabrication process during this day. Eventually, one of the designs – consisting of large planters for an urban civic garden [named Embarcadero/ Aldea Moret]– was built after the initial concept and actual design by one of the local Cáceres teams, with minor modifications made by the Fab Lab team to make it more robust, and easier to fabricate and assemble. 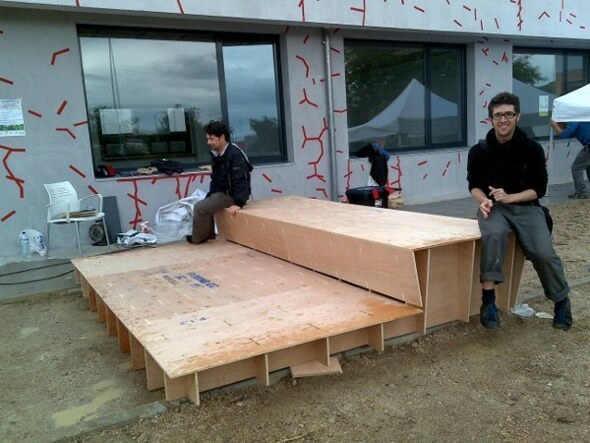 A second element, a small garden pavilion for the same site – that received the name of “Pergola-bench” – was based on a concept and design by the same Cáceres team, but thoroughly developed by the Fab Lab team. The socialization of the design and the fabrication process become new systems to design projects in architecture. This is an example of people manufacturing their own goods and developing solutions locally to serve a common purpose. We will continue sharing approaches about the commons ecosystem and digital fabrication in next post. Manuel Gutiérrez de Rueda García, José Pérez de Lama Halcón, Nacriso Vázquez Carretero, Percy Durand Neyra, 2011, FABWORKS Diseño y Fabricación Digital para la Arquitectura. Docencia, Investigación y Transferencia, available on line at http://issuu.com/pabloherrera/docs/fabworks_2011_low_update accesed 1 March 2012. Images of the workshop-seminars from http://htca.us.es/blogs/talleresfablab/category/taller-fabbing_cc/.